I have always been a fan of conspiracy theories in general, the JFK assassination conspiracy, The Moon landing conspiracy theory, the Art Bell alien theory, and all the rest. 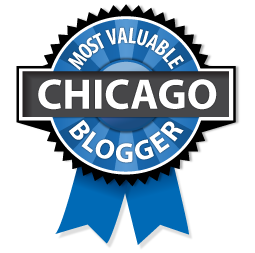 I don’t necessarily believe them, but I enjoy the thoughtful (and sometimes not so thoughtful) debate that takes place around these controversial topics. It is particularly satisfying for me when the conspiracy theory has a Rock & Roll element like the Jim Morrison is alive conspiracy theory and the “Paul is Dead” rumors that circulated after the four Beatles walked across Abbey Road barefoot in front of a VW that had a license plate that said 28-IF (he would have been 28 if he lived). I have it on good authority, by the way, that Sir Paul is very much alive and well as he was spotted at the Hotel Carlyle in New York City, sitting less than two feet away from my wife, drinking the $18.00 Martinis’, and gazing into the eyes of his then girlfriend and current fiancé. Unable to finish the last drink that was delivered to his table, he offered it to my wife who accepted it graciously and is now able to tell her friends that Paul McCartney bought her a drink. One of my favorite Rock & Roll conspiracies is the “Klaatu is the Beatles” conspiracy theory. Klaatu was a band out of Canada formed in 1973 and named after the extraterrestrial Klaatu, from the movie The Day the Earth Stood Still. The rumors that the band was The Beatles performing under a pseudonym were started after the release of 3:47 EST, released as Klaatu in the U.S. in 1976. In an attempt to “let the music speak for itself” the album contained no picture or individual names, only the band name. Klaatu. Even their record label, Capitol Records out of Los Angeles did not know the names of the band members. In fairness to the band, they did not start the rumor, always denied the claims, and no Beatle was involved in the making of the album. The rumor was actually started by a journalist from Providence Rhode Island who cited the “Beatlesque” sound on a couple of the tracks as proof that this was a project by the Beatles themselves. The flames were fanned as local radio stations picked up the bogus story and released a series of “clues” that were designed to prove the veracity of the story. The song “Sub Rosa Subway” is a song about building the New York Subway system and has a real “Wings” vibe with a vocal that is spot-on close McCartney at his best the sound is very 1968-1969 Beatles. The song is also said to be a take- off of McCartney’s Red Rose Speedway. The sixth song on the album, Doctor Marvello, has a George Harrison circa “Blue Jay Way” element to it complete with sitar backing, some backward masking and Lennon-like backing vocals. The closest thing to a hit single peaking at number 62 on the billboard charts was “Calling Occupants of Interplanetary Craft” that became the official anthem for “World Contact Day” and was also covered by Karen Carpenter. The song has definite Sgt. Pepper influences complete with horns, layered harmonies, and a slick, professional production effort a la George Martin. Adding gasoline to the inferno, beetles (the insect) can be heard chirping at the beginning of the song. 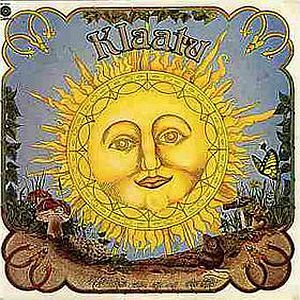 According to their record company, Klaatu can also mean “been here before”. A return? Pulling from the “Paul is Dead” playbook, on the inner sleeve of the Sgt. Pepper album Paul McCartney had a patch on his sleeve that read OPD, the “Paul is Dead” theorists believing this to mean ‘Officially Presumed Dead”. Eventually it was discovered that the patch actually read OPP which stands for Ontario Provincial Police. 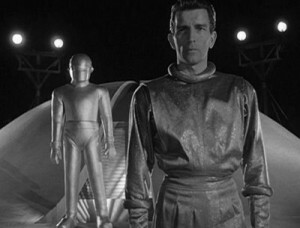 Klaatu was from Ontario. The song “Sir Bodsworth Rugglesby III” contains the lyric “I’m the only man who’ll ever get to hell and come back alive”, another presumed reference to McCartney and his supposed death in a car crash. The overall album is actually pretty good with each song having a unique sound that is more California surf Beach Boys or Electric Light Orchestra than Beatles. Like the best Beatles albums the production on the album is near flawless in places. If you want to call them “Beatles Lite” I am fine with that. They are excellent musicians with strong vocals and clever songwriting that has almost a nursery rhyme quality at times. As far as them being the Beatles, I heard no wailing Japanese woman on any of the tracks. John Lennon would never have consented to be part of a recording that did not include his avant-garde, artist-wife Yoko as part of the proceedings during this time period. And if you need more proof that this enigma of a band was not the Beatles, in 2011 the band that so carefully hid their image and kept their very existence shrouded in mystery is now on Facebook, MySpace, and Twitter with their own web site as well. Enough said. This is one of the greatest albums of all time! Good piece on this monumental album. what is 6 in addition to 4?